You'll be £6.00 closer to your next £10.00 credit when you purchase Tracing Your Edinburgh Ancestors. What's this? Edinburgh has been the capital of Scotland for the last 500 years and more. The 'Athens of the North' is the centre of Scottish banking, medicine, architecture, law and publishing. It is the home of Scotland's national museums and the location of the Queen's official residence in Scotland and of the General Assembly of the Church of Scotland. It is also the site of the Edinburgh Festival and Royal Military Tattoo, and the seat of the devolved Scottish government. The city is steeped in national, local and family history, and Alan Stewart's handbook is the perfect guide to it. He takes readers through the story of Edinburgh from the earliest times up to the present day, showing how its colourful history has affected the lives of their ancestors. The many genealogical records of Edinburgh are described in detail, and appendices cover genealogy websites, family history societies, and Edinburgh's many archives, museums, art galleries, castles and palaces. and for anyone with ancestors who lived in Edinburgh or surrounds, this is definitely one to add to the reference shelves of their workspace. Overall, this is a highly competent guide, which can not only provide much useful guidance for those with connections to the capital, but for anyone with Scottish ancestors, helpfully illustrating the range of records that might also be found elsewhere across the country. This book is extremely well constructed and combines ancient and modern historical information with genealogical data in a clear and logical way. Local and Family history is always entwined and this is well reflected here by Alan Stewart. There is some interesting background to the array of old villages that make up what is now Edinburgh, but this aspect could well have been enhanced further by at least making a reference to other salient books on Edinburgh’s local history scene. For example, William Baird’s ‘Annals of Duddingston and Portobello’, 1898); Dennis White’s ‘Exploring Old Duddingston and Portobello’, 1990) (which is unusual in that it mentions the names of many of the local inhabitants) and Joyce Wallace’s ‘Traditions of Trinity and Leith’, 1987). Perhaps an opportunity has been lost to readers whose ancestors lived in this part of Edinburgh. A nice feature of Alan Stewart’s book is the way in which the types of available records are categorised, including births, deaths, marriages, censuses, churches, burials, wills, property, courts, tax, schools, universities and statistical accounts. Importantly, this feature is enhanced further by showing, under most of these headings, where the records are actually located. This is valuable and provides a good map to point the reader in the appropriate direction. This volume would have been even more powerful had it been possible to include information on the types of state school records held by Edinburgh Archives, instead of simply making a reference to the archive itself in this regard. A reference to local hospital records may also have been useful if, indeed, that were possible. Although a list of available and relevant websites can change quickly, the ones listed in the book are certainly helpful at this point in time. However, had Appendix 1 included a reference to the website of the Scottish Military Research Group, which records the names of casualties and photographs of all types of memorials, this book would have been an even more powerful handbook to add to the shelves of family historians. It can easy for critics to point out what is missing from this kind of work, but nonetheless, Alan Stewart should be congratulated for presenting us with such a useful and attractive volume. Alan takes readers through the story of Edinburgh from the earliest times up to the present day, showing how the city’s colourful history has affected the lives of their ancestors. 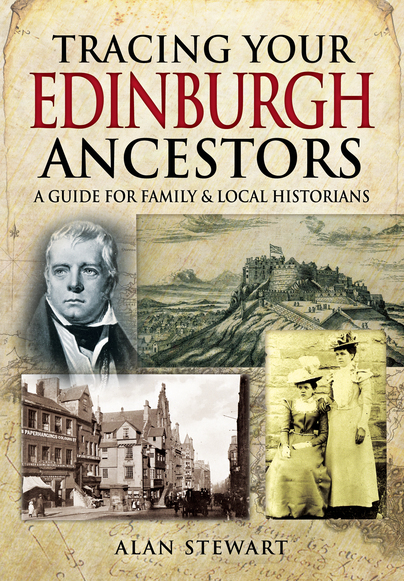 The many genealogical records of Edinburgh are described in detail, while appendices cover genealogy websites and Edinburgh’s many archives, museums, art galleries, castles, palace and family history society.